The passage of a short time often has a great effect, especially when the status quo for many centuries of Christian theology is challenged such as the case with the Bishop of Durham quoted above. The problem with such sound bites above, is insufficient time to properly evaluate what could be the reasoning behind the words of the Bishop. All too often those who subscribe to the party line often never bother to consider what the Bishop had to say or the reasons for it. Many instinctively bury their heads in the sand and write the whole thing off as falsehood because…… well it is just ‘liberal theology’ or some other ‘ology’ written by a man after all! One FaceBook user who has never read “Paul & Jesus How the Apostle transformed Christianity” by Dr. James D. Tabor) was quite happy to be busy reading Wilbur Smith’s novels which in their opinion are much more entertaining. Tabor’s work claims that Paul effectively transformed Christianity from a thoroughly Jewish sect into something that would have been altogether foreign to Jesus and his first followers…..
Tabor works through six major points he derives from Paul’s letters to clearly show how Paul transformed the way people believe and in the process caused an irreparable rift between his own views and the views of the authentic “Jewish” faith of Jesus and his first followers. Paul and his views effectively won and authentic Jewish Christianity became marginalized and silenced. Church creeds would follow suit. Literal meanings of concepts would be replaced by allegorical interpretations carefully presented by the “least of all apostles.” The one who persecuted Christians at first became the champion of a new religion in the end. The quote above about a series of visionary experiences or revelations of a “heavenly Christ” gave me a sense of déjà vu back to a time a number of years ago when my wife and I received a visit from the Mormons. Those clean cut missionary guys were most anxious for us to take their “another Testament of Jesus Christ” and pleaded with us to just pray to G-d to see that it was indeed true. Needless to say, whilst there appears to be a qualitative difference between the New Testament and the Book of Mormon, the book of Mormon also steals from the Christian bible too. The reading on our respective BS detectors never the less was still high with respect to both books and their claims! How a Christian can easily write off the book of Mormon because it is based on one man’s visions and yet accept a version of Christianity by Paul who also had a number visionary experiences or revelations of a “heavenly Christ” too, I just cannot compute!!! I cannot compute because neither Joseph Smith or Paul never actually met Jesus in the flesh. What sort of calculation goes on in the Christian mind? Moreover, there is scholarly evidence to show that Paul wrote his epistles before everybody else and the later Gospels were heavily modified according to Paul’s version of Christianity. Not only where the Gospels heavily modified according to Paul’s version of Christianity but the church also added its developed theology, influenced by paganism onto the redaction of the New Testament and thus was added the Trinity, the Virgin Birth and Original Sin and the rest is history…. as they say. Because Paul circulated his version of Christianity before the apostles James and Peter (who actually knew Jesus and his teachings) and that Paul’s ministry was strategically ministered mainly in the more organized Western Roman Empire, the original Christianity of James and Peter ‘fizzled out‘ in the Middle East by the end of the fourth century CE. “When the true Messiah king will arise and prove successful, his [position becoming] exalted and uplifted, they will all return and realize that their ancestors endowed them with a false heritage; their prophets and ancestors cause them to err.”] Chapter 11 of Hilchos Melachim from the Mishneh Torah of the Rambam. 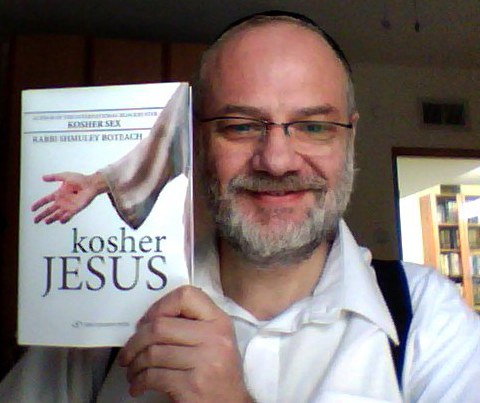 Shmuley Boteach’s “Kosher Jesus” (Jerusalem and New York: Gefen, 2011) is a bold attempt by a person of great ability with no formal training in New Testament studies or the study of Second Temple Judaism to present a Jewish treatment of the founder of Christianity, his relationship to the Jewish people, and the narrative of his life in the Gospels. Beyond that, Boteach sets forth an entirely new and controversial paradigm for Jewish understanding of Jesus and for Jewish-Christian relations. From the beginning, Boteach wants us to see his book as totally revolutionary. Yet parts of it are, in fact, totally unoriginal, and that those parts that are most original put forward rather questionable suggestions. One of the supposedly original theses of this volume is that Jesus can only be understood by Jews and Christians if placed in the context of Second Temple Judaism. But actually, this is an axiom of all contemporary New Testament scholarship and nothing that Boteach has just discovered. What is unfortunate is that an entire world of scholarship on Second Temple Judaism, much of it the result of the discovery of the Dead Sea Scrolls, makes absolutely no appearance. This research has shown us the background of the apocalyptic messianism of Jesus and his disciples, and has revealed that the movement he created cannot simply be seen as a Pharisaic, proto-rabbinic movement in spite of some similarities in interpersonal ethics. The messianic teachings and numerous terms and symbols of early Christianity are derived from a world of Second Temple Judaism that included sects that followed an alternative system of Jewish law and extremely apocalyptic messianic teachings that do not accord with later rabbinic teaching. Boteach argues that the descriptions of Jesus in the Gospels do not represent in any way an accurate picture of him. In his view Jesus was a rabbi who did not deviate from the observance of Jewish law, and was a heroic revolutionary opponent of Roman rule. This view has been suggested before, but it has failed to be accepted, precisely because there is absolutely no real evidence for it in the New Testament. Such claims represent speculation devoid of any kind of historical basis, driven by Boteach’s attempt to reconstruct history in the image of his own beliefs. Jesus’ teachings, as quoted in the Gospels, certainly in the ethical sphere, seem to be based on those of the Pharisees. But to call him a “Rabbi” is a ridiculous anachronism. (Boteach admits this but does it anyhow.) The term “rabbi” in his time, by which he is sometimes addressed, is to be translated “my master.” There is no evidence that Jesus ever sat in a rabbinic academy, and no system of ordination or designation of any individuals as rabbis existed at this time, the title “rabbi” beginning only with the gathering of the sages at Yavneh, ca. 80 CE. The notion that Jesus in no way disagreed with, rejected, or opposed any aspect of Jewish law and practice of his time is a necessary pillar of the author’s claim that Jesus can be reclaimed by the Jewish people as a loyal “rabbi.” The earliest layers of the Gospels already relate certain disputes between Jesus and the Pharisees where Jesus as arguing subtly against specific Pharisaic laws. We find that Jesus represented the most lenient approach; the Pharisees represented a middle-of-the-road approach; and the Dead Sea sectarians preserved for us a much stricter view. While it is convenient for Boteach to dismiss the accounts of the disputes in the Gospels, the Dead Sea Scrolls confirm that these very issues of Jewish law were being discussed by all Jewish groups, making the Gospel accounts highly credible, contra Boteach’s claim. Furthermore, the author compares rabbinic literature with the teachings of Jesus in an attempt to demonstrate that Jesus adhered to rabbinic law. This approach ignores the chronological problem of the dating of rabbinic teachings, many of which are explicitly shown to have appeared after the death of Jesus and the rise of Christianity. Boteach claims that Jesus ought to be reclaimed by the Jewish people as a great teacher, despite the fact that he thought of himself as a messianic redeemer. He correctly asserts that it is no transgression to identify oneself or anyone else as the messiah. Boteach’s also asserts that Jesus did not consider himself divine. This is probably correct, specifically because the Gospel accounts do not in any way impute this point of view to him. However, shortly thereafter in the Pauline Epistles (c. 50-60 CE) and the Gospel of John (c. 90-100 CE), this identification is made explicitly. We have no scientific way of establishing what the actual teachings of Jesus were in order to define them as legitimate expressions of Judaism. We cannot simply accept Boteach’s claim that whatever Jesus says that we like is an accurate historical portrayal while whatever we dislike comes from later strata of Christianity. This is simply an arbitrary assumption and not scholarship. The author denies that the Talmudic references to Jesus (found only in uncensored manuscripts) really refer to the early Christian teacher. Rather, he claims that the Talmudic Jesus is someone else. In reality early Jews had little accurate information about the period, especially in Jewish Babylonia where the Talmud was assembled. These sources give the wrong names for Jesus’ students and provide incorrect dating for him, but we cannot deny that the Talmudic accounts intend to describe Jesus despite their incorrect historical details. Instead, traditional sources do, indeed, refer to Jesus and set forth the way in which Jews have understood Jesus. These sources include Talmudic references, Maimonides’ Code of Jewish Law, and numerous medieval polemical texts that resulted from the Jewish-Christian debate. Our sages have held what is essentially an ambivalent view of Jesus and, I would submit, such a view is appropriate even in modern times. Let me explain: Our sages recognized that Jesus was associated in some way with the Pharisaic-rabbinic tradition, but they also understood that in some ways he deviated from that tradition, such that he led many Jews astray. For this reason, they did not seek to reclaim him as one of their own. Further, our sages understood that it was impossible to disentangle his image from the claims of messiahship and divinity. These images are so strong in Christian texts and tradition that the assumption that one can reclaim for the Jews a different, Jewish Jesus is simply naïve. Jews are better off continuing to see Jesus as “the other,” but at the same time treating our neighbors with respect. Most importantly, such an approach allows us to define ourselves and Jesus in a way that makes clear the lines between us and our Christian neighbors—lines that must be clear both to our community and to theirs, and especially to our children and youth. Boteach explains in detail why the distinctive Christian beliefs, such as virgin birth, the Trinity, the divinity and messiahship of Jesus, and the abrogation of the law are totally opposite to Jewish beliefs and must be rejected by committed Jews. Furthermore, he explains, it is impossible to consider one who did not bring about the long awaited, complete redemption as the Messiah. It is this aspect of the book in which the author is most at home. Nevertheless, he asserts that reclaiming Jesus the Jew makes it possible for Jews and Christians to continue the development of their new relationship launched with Vatican II—a new friendship between the Catholic Church, Evangelical Christians, and the Jewish people. My problem here is not with the author’s argument that the relationship of the Jewish people with many Christians has changed radically for the better—I completely agree. My problem is with the strategy with which he wishes to expand and maintain those relationships. This gets to the very heart of intergroup relations. I would argue that our good relations with Catholic and Evangelical Christians stem from a full recognition of our disagreements. For me, true openness and tolerance come when we cooperate with and maintain friendship with those with whom we fundamentally disagree. I find greatly mistaken the author’s claim that Jewish-Christian relations would be advanced by a Jewish re-acceptance of Jesus as a hero and teacher. It is a step that would, in fact, work against rather than for close relations with Christians. My own experience in Jewish-Christian relations tells me that when we recognize and overcome our differences, we create stronger and better relationships than when we minimize these differences. One of the main principles of interreligious dialogue must be that we not try to tell our Christian neighbors what to believe. Yet so much of this book aims to do exactly that. For underneath its argument is essentially a claim that the Jesus that Christians believe in is not the historical Jesus but rather a falsification by Paul and other later Christians. Such arguments do little to enhance Jewish-Christian relations. Lawrence H. Schiffman is Vice Provost for Undergraduate Education and Professor of Judaic Studies at Yeshiva University and Edelman Professor Emeritus of Hebrew and Judaic Studies at New York University. He is author of numerous books and articles on the Dead Sea Scrolls and early Judaism, including Who Was a Jew? Rabbinic and Halakhic Perspectives on the Jewish-Christian Schism (Ktav Publishing). He represents the Orthodox Union on the International Jewish Committee for Interreligious Consultations (IJCIC) which he currently chairs. I just started reading Eisenman’s book…..